In his 7 short years, O has taken us on lots of adventures! His birthday celebrations are just a small flavor of what makes him shine. When O was turning 4 he announced he wanted a Safari party and outlined the party with a slide show using photos his grandparents took while in Africa and a scavenger hunt. On his 5th birthday we took a ride on the "Dinosaur Train" and traveled through the Triassic, Jurassic and Cretaceous periods. Last year we celebrated the Chinese New Year with food, crafts and a dragon parade. This year he requested an American Indian celebration, honoring the Ojibwe culture. In preparation, we read lots of books, visited the Fond du Lac Cultural Center and Museum, attended a Pow Wow at Nettleton Elementary School and consulted the 13 Moons Program Coordinator at the Fond Du Lac Tribal Extension Program. The Ojibwe (Anishinabe, Ojibway) moved to the Lake Superior area from Eastern Canada in the 1500 or 1600s. It is the largest tribe north of Mexico and has made significant contributions. On one of the coldest days of this year’s winter, it was only fitting to read Shingebiss: An Ojibwe Legend by Nancy Van Laan. Shingebiss, the duck, must be tenacious, wise and strong in order to endure the winter. We also played several traditional Ojibwe games: the Snake Game, the Moccasin Game and a Bean Dice Game. "Three Sisters" could sustain life when other sources of food were scarce. Corn was planted first, and at the base of each seedling, bean and squash seeds were planted. The beans added nitrogen to the soil, feeding the corn, and climbed the stalks. As the summer heat increased, the squash leaves helped to shade the corn and beans roots, conserving moisture and crowding out weeds. The three sisters is a classic case of companion planting. As we were serving, the kids started chanting Walleye, Walleye, Walleye! In fact, it went so quickly that we failed to get a photo. Any doubts of the kids enjoying the food quickly dissipated. They all had their favorite dish. Combine all except oil in food processor. Process the ingredients briefly, then drizzle in oil with machine running. The pesto can be made ahead and you will have extra to use for other purposes. 1 or more heaping tablespoons sage pesto. 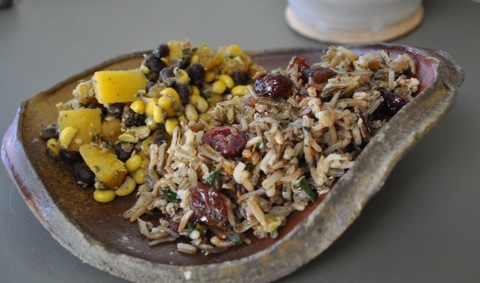 We adapted a recipe from Vegetarian Times for Wild Rice with Cranberries, Maple Syrup and Mint by adding 3 T orange zest, juice from half a lemon in addition to the orange juice, added salt and pepper and replaced pumpkin seeds for the pine nuts. 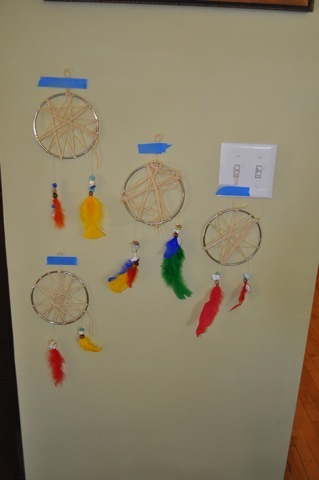 Several parents have mentioned how their kids have found special places to hang their version of a dreamcatcher, to catch the bad dreams in the webbing and allow the good dreams to flow down on them. I know my kids have been sleeping extra good after all the activities! 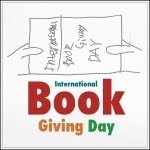 For Valentine's Day, to continue the celebration and honor International Book Giving Day, my kids received a copy of The Birchbark House by Louise Erdrich and the Legend of the Lady Slipper (Ojibwa Legend ) by Margi Preus and Lise Lunge-Larsen. They are excited to continue on this journey! We'll pay it forward by donating books at Congdon Elementary's Bingo for Books, United Way's Big Red Bookshelf and a donation during O's dentist visit. The novel tells the story of a seven year old Ojibwe girl living in the 1800s. 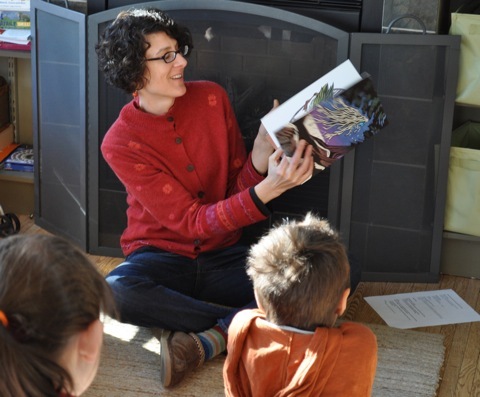 Ininatig’s Gift of Sugar: Traditional Native Sugarmaking by Laura Waterman Wittstock. The book describes the tradition of making sugar from the syrup of maple trees. Tells the origin of the lady slipper flower. Documents the history, traditions and culture of the Ojibway people. An Ojibwe boy and his grandfather spend a day enjoying nature on a lake near their home. Part of the Native American Histories series. The book describes the tradition of harvesting and using wild rice in modern times. The legend of Shingebiss, the duck, who must be brave and strong in order to endure the winter.